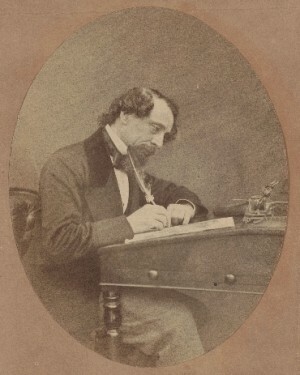 From the tip of his quill pen Dickens conducted his life - conscious and in control of all the moving parts. He took such an interest in so many things: art-directing his publications, producing amateur theatricals, raising money for the less fortunate, planning outings and holidays with his family and friends, and expressing gentle and sometimes not-so-gentle concern for their well-being. Dickens was an exceptional correspondent; many of his letters are every bit as engaging as his published works. Letters to close friends where he jokes and teases them affectionately, instructions to the artists who were illustrating his works, correspondence explaining his worldview and his reasons for writing what he did illuminate the way Dickens lived and worked. The exhibition shows the works that were the product of the author’s creative genius and places them in the context of the life of a man for whom no detail was too small and who wielded the power of his celebrity for the causes he believed in and for the good of those he cared about. The Free Library is home to one of the finest Charles Dickens collections in the world, mostly owing to the generosity of two distinguished benefactors. William McIntire Elkins, a Philadelphian and a trustee of the Free Library, bequeathed the Library a complete record of Dickens’s literary and public career. D. Jacques Benoliel, a Philadelphia industrialist, focused his collecting on Dickens's lifelong passion for the theatre. His collection of autograph letters and playbills was donated to the Free Library by his family after his death in 1954 and has been extensively augmented from an endowment set up by the family in Mr. Benoliel’s memory. The exhibition runs through May 25, 2012 and can be viewed Monday through Saturday from 9:00 a.m. to 5:00 p.m. in the Rare Book Department on the 3rd floor of the Parkway Central Library.